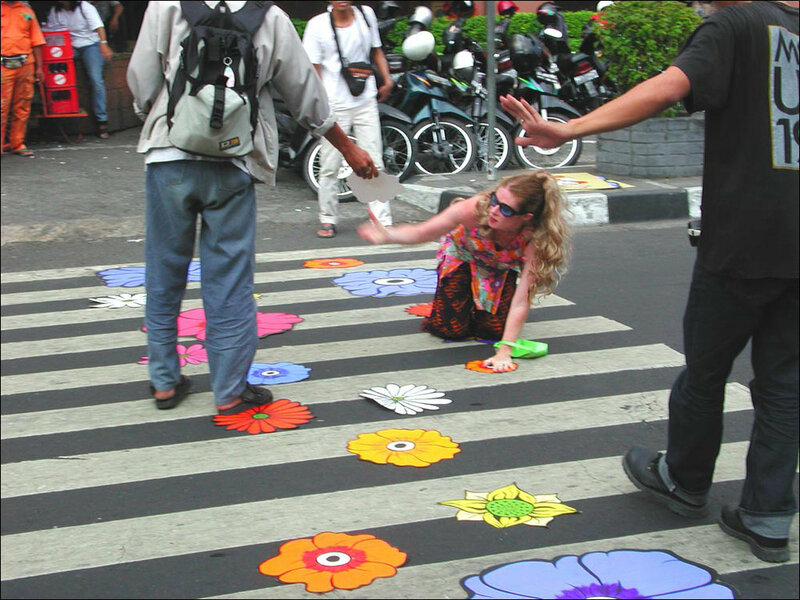 Flower Interruption: Yogyakarta Indonesia took place on Monday, July 29, 2002 at 2:00 pm on Malioboro Street, the center of activity in Yogya. Maliboro extends from the railway tracks to the public square where the Sultan’s palace is located. Shops and booths line the street, packed ceiling to floor with goods. The street is quite lively with vendors, shoppers, becaks (three-wheeled bicycle transport), cars and motorbikes. 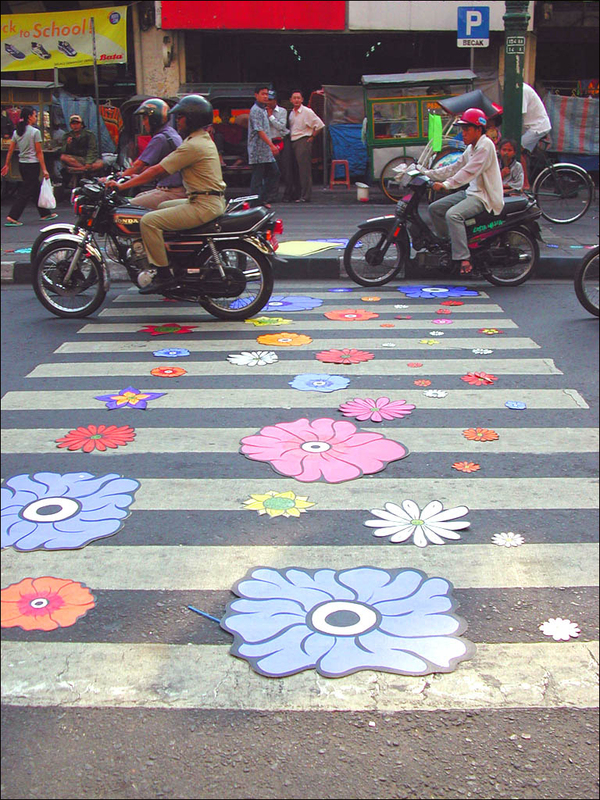 I began installing the flowers on the median in between the lanes of cars, motorbikes, and becaks. I then moved into the intersection and placed them within the crosswalk. The action drew a lot of attention with a number of people gathering to see what was happening and vehicles slowing down to try and make sense of what they were seeing. When we finished installing in the first area we moved further down Malioboro. After about half an hour, I realized that I had left my portfolio back at the initial installation. I ran back to see if I could find it. As I approached the area, I could see a group of becak drivers standing together elbowing each other and looking very guilty when they saw me coming. I had no idea what was going on until I got closer and could see that they and the vendors had pulled up most of the flowers and used them to decorate their becaks and booths. Of course, I was thrilled and delighted by this (and they were very happy that I was) – to see the development of the afterlife of the work and the appreciation for it.